With so much to see and do in the Magic Kingdom, people end up covering a lot of territory. 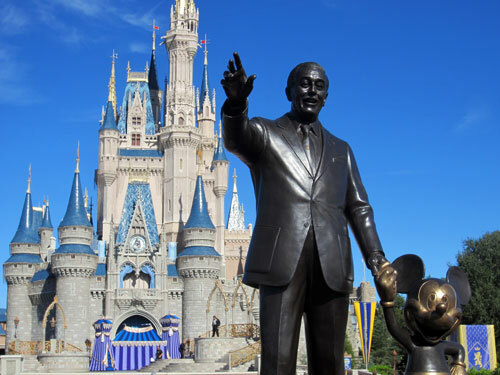 Most reports on the internet estimate that people will walk anywhere from 9 to 15 miles a day while at Disney World. That means that you might want to plan a few breaks to stop and rest, at least briefly. Otherwise, you might not have the energy to last the full day. Fortunately, there are a few places where you can sit and relax. 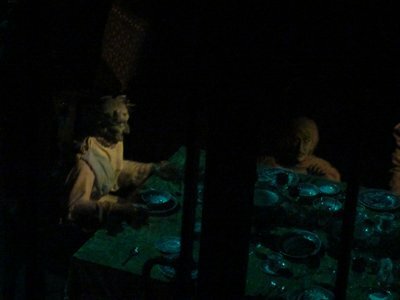 Yes, you can relax while seated on an attraction, and you can relax while seated in a restaurant. 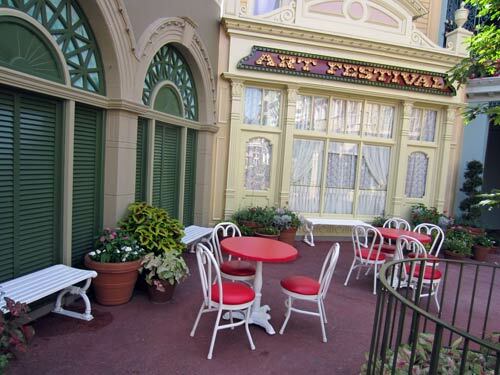 But today we are going to talk about places where you can sit for “free” with no strings attached: you don’t have to wait in line (like with an attraction), and you don’t have to feel guilty about lingering and ‘taking up a table’ (like at a restaurant). Some of these locations have very limited seating areas. But perhaps surprisingly, since they are sometimes out of the way, they are also still often available for your enjoyment. 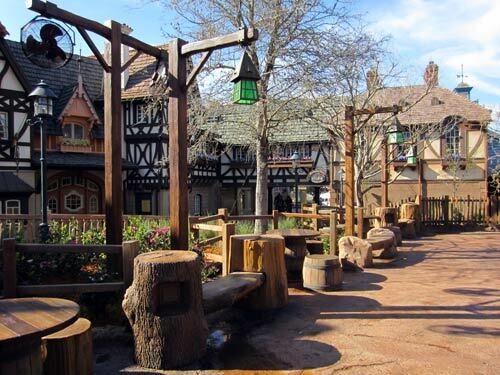 If you are looking for a place with a few shade trees, a little brook, and some seats that invite you to hang out for a few minutes and even charge up your phone, look no further than the seating area near the Tangled rest area in Fantasyland. Located not far from It’s A Small World and the Haunted Mansion, this area is an oasis from the crowds and concrete that otherwise fill this area of the park. Have a seat and rest for a few minutes. 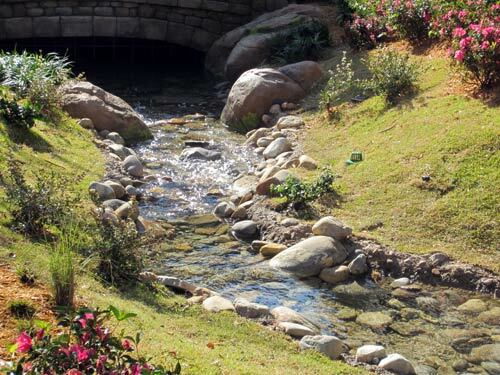 Enjoy the views of the nearby brook. So many people run down Main Street on their way to something else that they don’t realize that there is a cross-street on Main Street called Center Street. You will find it about half way down by the Crystal Arts shop. 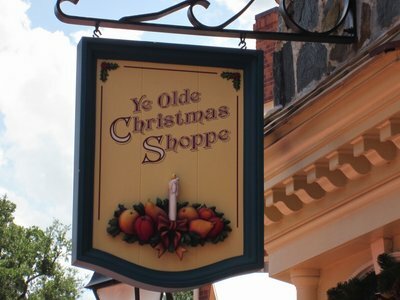 When headed toward the Castle, take a right and you will find a quaint set of quiet storefronts. Near the dead end are a few chairs, tables, and benches. It’s a great place to relax! Often overlooked, Center Street offers a quiet place just steps from Main Street USA. 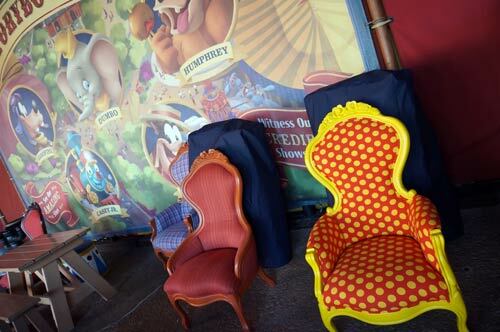 If you are looking for a place to simply sit and relax for a few minutes, the rest area in Storybook Circus is a great choice. It’s covered from the Florida sun and it even has spots where you can charge up your smart phone. It’s also got plenty of interesting design elements to take in while you take a load off. Have a seat in grand circus style. All around Cinderella Castle you can find scattered seating areas. Most are small, with a bench that will accommodate just a few people. But all give you a chance to sit down and relax – and also enjoy the beautiful views of the Castle and the surrounding areas. 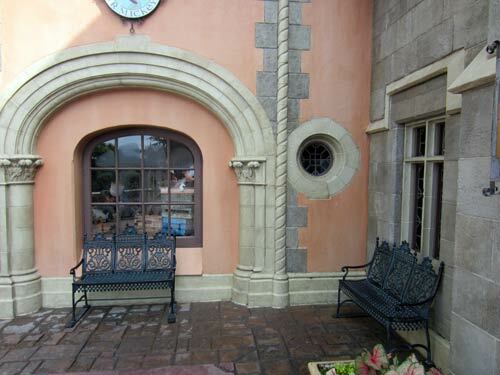 There are many places to sit in the shadow of Cinderella Castle, like at these benches near the Sir Mickey’s gift shop. 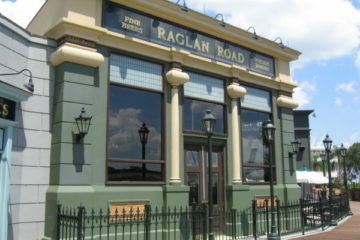 This is one of the largest areas, since it used to be a small restaurant. Today this spot on Tom Sawyer Island in Frontierland has vending machines, so I don’t count it was a live restaurant. 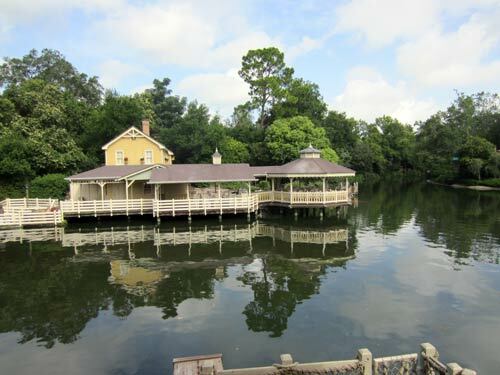 But there are plenty of seats, covered from the sun, where you can look out on the Rivers Of America and the surrounding area that includes the Liberty Belle Riverboat and the Haunted Mansion. Plenty of places to sit and relax on Tom Sawyer Island. 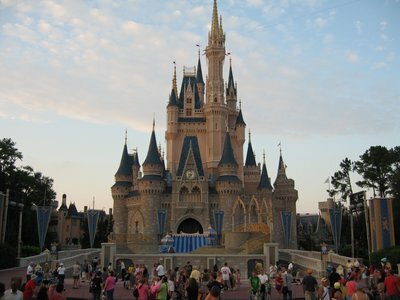 Do you like to sit for a few minutes to just relax at the Magic Kingdom? 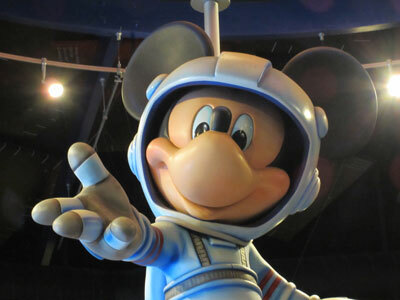 Planning for Your Disney Vacation is Important – But How?